Many people have come to underestimate how dangerous chain saws are and the immense harm that they can cause to an operator or innocent bystander if they are not used responsibly. Their widespread appearance in movies and video games has made the general public view them as more of a novelty than a tool that has a purpose and requires training to use properly. Despite the risks associated with them, chain saws do not require licenses to operate and many of the people who use them lack such training and are unaware of safety protocols that would keep them out of harm’s way. Many of the injuries caused by chain saw are due to recklessness, poor judgment or a lack of understanding concerning safe and responsible use. Chain saw operators are capable of harming themselves and people around them when they fail to follow these general guidelines. Chain saws should never be air dropped to start— a process in which the user drops the chainsaw with one hand while pulling the start cord with the other. This can result in losing control over the chain saw. Chain saw blades become dull, creating a hazard when the chain saw must operate with more force to create a cut. Blades should be routinely sharpened and many operators are not trained on how to do so properly. Chain saws have limitations and users should be aware of whether the chain saw being used is suitable for the job at hand. Some jobs require saws with greater horse power and torque to power through larger objects while others require more precision and finesse. Chain saws should never be used in the absence of other people. It is important that the operator never uses the chain saw alone because the presence of another person ensures that if something unfortunate should happen that the operator will have someone to assist him or her in getting medical attention. Chain saw operators should wear proper safety equipment which includes a helmet, safety glasses, protective gloves and leather chaps and boots. Operators should avoid use around hard objects such as stones or metal and should never work around power lines or electrical wiring. Kickback is a major cause of injury due to the fact that it can occur even in chain saws advertised to reduce or eliminate it. When an operator loses control of the chain saw is when it is most probable that an accident will occur. On occasion, the omission of information or lack of warnings in chain saw instruction manuals or manufactural defects may be the cause of an injury. The reckless use of a chain saw may also endanger others and cause bodily harm. 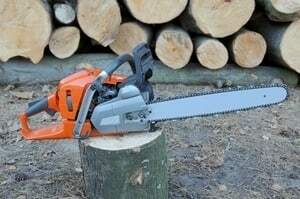 If you have been injured in a chain saw accident, it is important that you quickly establish a timeline of events in order to determine the cause of the accident. The information you are able to gather or provide to an attorney will help establish your case should it be determined that another party is liable. If you are injured while on the job, your employer is required to provide you with workers’ compensation but you may also be entitled to claim damages if the employer did not provide adequate training or safety equipment prior to the accident. The manufacturer may be considered liable as well if the chain saw malfunctioned due to a defect or poor design. Compensation can include the cost of your medical bills, pain and suffering and any wages you lose due to the inability to work. If your injury affects your ability to retain or gain future employment, you may be awarded damages for the loss of potential income as well. Contact the Rosenfeld Injury Lawyers LLC today to learn more about your rights during a free consultation with an attorney. We will perform an investigation after collecting all of the information we require from you in order to determine who is liable for your injuries, the approximate value of your case and how we would advise you to proceed. Each of our lawyers is qualified and experienced to handle your case with the greatest care and expertise. We guarantee our work and if we are unable to collect money on your behalf, our services will cost you nothing.